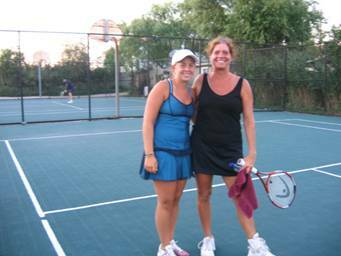 Jane (with Gracie Wood) wins the Kismet Tennis Tourney! Ok, summer of 2007, coming to an end, and I'm beginning... that is par for the course these days when Fair Harbor looks nothing like it did... a friend of mine said it looks as though a day care center exploded... WE HAVE MILLIONS OF KIDS, in fact the group houses of old have been replaced by the group houses of families...The annual Fair Harbor Fire Dept kids parade really benefits from all these little ones...Some of the outstanding "floats" belonged to the ever creative grandchildren of Marty (happy recovery) and Anita Rich, Alex braving the NY crowd with his homage to the Green Monster... in keeping with this year's theme of "GREEN"... also seen on floats were the Brozan babies, and countless others, it took MC Jack Gellately a long time to honor them all, bring on the franks Seen making sure the festivities went well was FHFD's best party planners, Brett Roberts and Merri Fisher. No less than 6 Harborites entered the Kismet Tennis tournament: Binnie, Tony F, John, Jeff and the winning-est couple Jane (won this year) and hubby Dean (won last year). Hey, how come we don't have our own tennis courts? Our local hangout, Le Dock (aka the dock) has enjoyed a huge summer since adding outdoor dining to our humble hamlet.... It gets a bit crowded downtown with all the bikes, babies and dogs, but biz is good and so's the food, a special nod to the service "crew" at Le Dock, it's the best service in town, and we have that very able crew, including Kirsten Tannen and all her homies... to thank... Cheers to Patrick and Melissa.on a great year. Who took that great photo of Milton Pike and Nevio Maggiore?? Was Olga far behind them...? Where's Tony ??? all questions for Paula and Sandy to ponder as they leave FH this summer. Kudos, as always, to our lifeguards... Richie and his gang did a phenom job this year guarding our shores and watching the waves. The ocean is a huge part of life here and with lots of kids and newcomers abounding, it's comforting to know we have such well trained guys on those highchairs... We need a lifeguard reunion to gather all those guys together. Heather McDonald is running for Fire Commissioner this year... I think it's high time for a woman in many high places and I hope Fair Harbor will lead the way in that department .... she also is a great hostess, having the first party of season- co hosting with Cedric and Lori and half of the dynamic kid duo of Morgan and Alexa (daughter of Bobby and Linda Kerr). We enjoyed a couple of fine pancake breakfasts this year, run by the Fair Harbor Fire Dept... Seen flipping cakes were Russ, Bobby Chinkel, and Dan Priest... did we see Uncle Neal selling those chances? And welcome back to Bea Thornberg who takes her job as coffee maven very seriously.... We do miss our Ladies Auxiliary gang, but the guys did a great job..
What's up with Marge Tannen... was she seen on a golf cart or was that a figment of our imagination..... I'm sure she has a permit. Anyway, as the summer of 2007 comes to a close, we wish everyone a safe and healthy winter, and now those lucky ones who are still around get to enjoy the many fall classics that Fair Harbor has to offer. We have the FHCA Annual barbeque on Sept 15th and the potluck is tentatively set for Sept 22.... There is a still some fun left..